The institute is expertly run and very well supported. I cannot imagine a better fellowship experience. Dr Juha Saatsi is a Lecturer in the Department of Philosophy at the University of Leeds, focusing on the philosophy of science. He studied theoretical physics (MSc) at Jyväskylä University in Finland, followed by further studies in mathematics at the University of Leeds. After coming into contact with the philosophy of physics he swapped to philosophy, earning his PhD at Leeds in 2006 with a thesis concerning the limits of scientific knowledge. Soon after graduation he was employed at the University of Leeds. Dr Saatsi has broad interests in the philosophy of science and beyond. Much of his research is driven by deep interest in the scientific realism debate concerning philosophical challenges to scientific knowledge. What can we really claim to know about the fundamental nature of light, for example? The history of science, the intricacies of fundamental physics, and the overall nature of scientific theorising give rise to fascinating challenges to any attempt to read scientists’ assertions regarding light more or less at face-value. Dr Saatsi’s research on scientific realism crosses over to the philosophy of physics and the philosophy of mathematics, as well as the history of science. Other topics of active research range from the nature of scientific representation and modelling, to the nature of scientific explanation. He has published numerous articles in prominent journals including, among others, Australasian Journal of Philosophy, British Journal for the Philosophy of Science, Philosophy of Science, Studies in History of Philosophy of Science, and Synthese. He is a co-editor of Continuum Companion to the Philosophy of Science, and the author of ‘Scientific Realism’ in Oxford Bibliographies Online. In 2011 he was a Visiting Fellow at the Sydney Centre for the Foundations of Science. While at the IAS in Durham Dr Saatsi will be working on historical and philosophical issues relating to our knowledge of the fundamental nature of light. Dr Juha Saatsi reviews the key issues in the 'scientific realism debate' in relation to scientific study of light and its history. 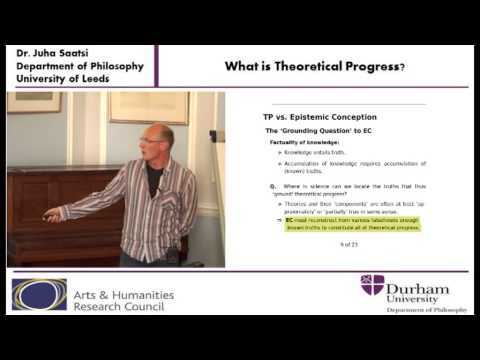 The realism debate concerns philosophical challenges to scientific knowledge. The science of light (optics and quantum physics) offers much ammunition to a sceptic who wishes repudiate the notion that science has revealed us the nature of light. The challenge to realism is serious, but not fatal: there is still room for a suitably qualified form of realism. He will assess leading competing realist responses to answer the question: what do we really know of the nature of light?